Requested tutorial from a student of the SCAL 4 ScrappyDew Classroom. At the time this tutorial was written (April 5th, 2017) the current software version is Sure Cuts A Lot 4.060. TIP: Be sure to save your design frequently. 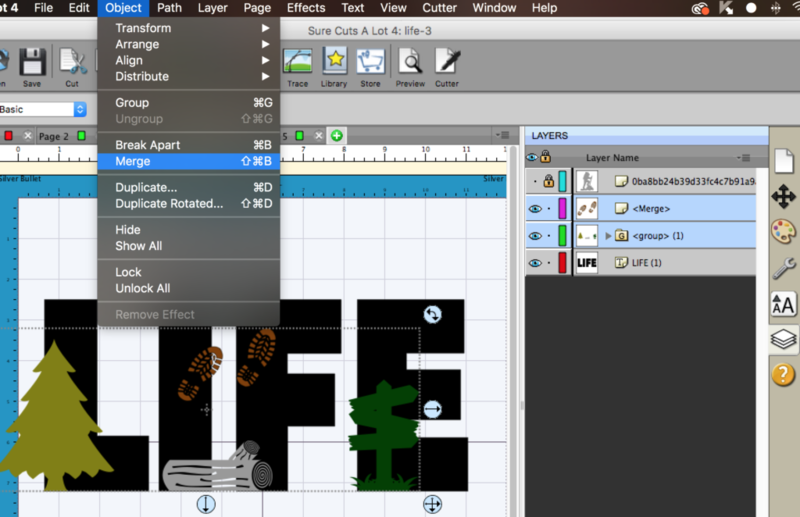 You can do so by clicking on the Save icon in the Toolbar or Main Menu >File >Save Project. The theme for this design is Hiking. Pine tree, log and wooden sign SVGs are from the Happy Campers digital file by ScrappyDew.com. Hiker and boot print images, not sure of the source. Use a nice block type font, such as Arial Black, Impact or Avenir Next Heavy. 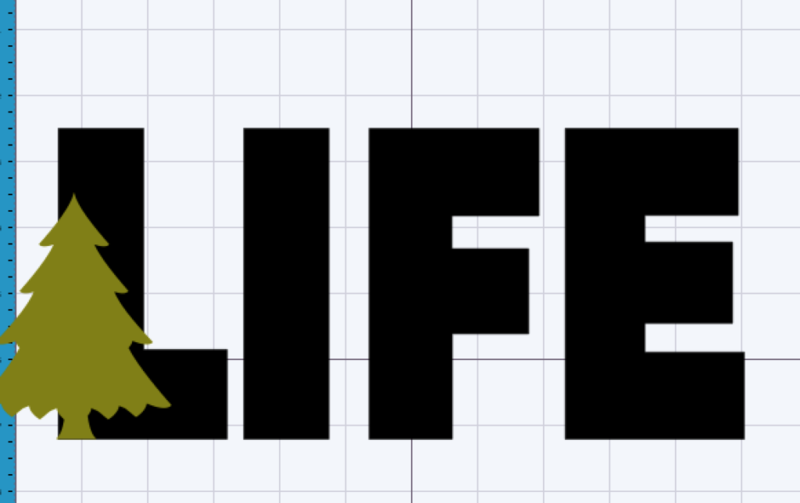 Click the Type Tool icon, type LIFE in uppercase letters. Click on the Selection Tool >Uncheck Keep Proportions (if checked). Place your cursor on the bottom right resizing handle, while holding the left mouse button down, drag to resize the text accordingly. Prior to the next step, you can adjust the Tracking or spacing between your letters. Click on the Text Settings icon to open the Text Panel. Use the up and down arrows to increase or decrease the tracking. Add the first shape to your text. Select a basic shape from the Library, or import an SVG by going to File >Import or clicking the Import icon on the Toolbar. The shape can be resized to fit inside or positioned so it will be subtracted from the letter. Continue adding shapes to the text until your design is complete. 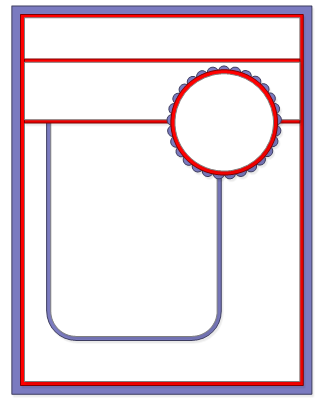 Once all shapes have been added, select all layers except for the text. Go to Object >Merge. 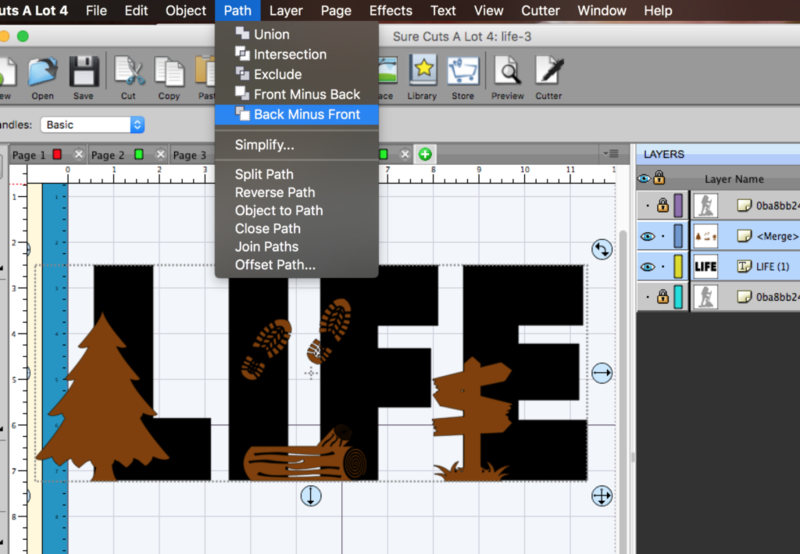 Select all layers including the text >Path >Back Minus Front. 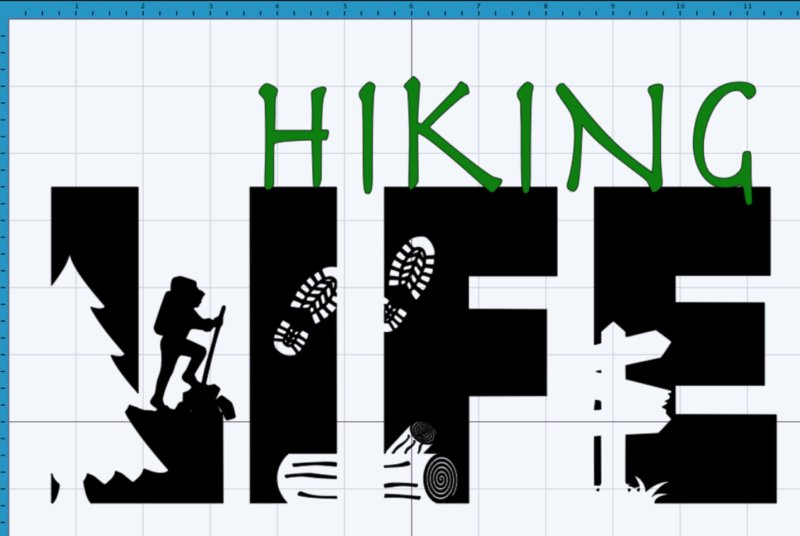 I decided to add a silhouette hiker to the design, it was missing another element. 🙂 The font used for the hiking text is called Herculanum. Kind of plays off the walking or hiking stick in the hand of the hiker. Just one way to create this type of design, there are many different versions. I hope you found this tutorial useful. 🙂 PDF versions will be available once I re-edit them. Love this tutorial. So many ideas floating through my head….you maybe seeing them soon.